CLT Update: 05 Apr 27 - MTF column is ammunition for tax-and-spend "TEAM"
MTF column is ammunition for tax-and-spend "TEAM"
South Shore legislators are proposing more than $21 million in additions to the state budget for pet projects and hometown needs. Budget watchdogs frown upon legislators tacking spending projects onto the state budget, and add that many items amount to legislative pork. "In a better world, the amendments would all make sense and be worth debating," said Barbara Anderson of Citizens for Limited Taxation. "This is simply pork, they go in and get as much money as they can for their districts." After resisting pressure from rank and file lawmakers to add money for pet projects, House budget leaders relented yesterday, tacking dozens of local initiatives onto the proposed $23.7 billion state spending plan. But lawmakers say earmarks are often the one sure way to bring home money for important local projects. The Democrats in the Legislature wanted to give you that tax cut they promised you in 1989 and that you voted for in 2000, but they just couldn't "afford" it. Despite the widespread perception that improving revenues signal the end of the Commonwealth's financial woes, largely uncontrollable spending in a handful of major programs is outpacing revenue growth, leaving next to nothing for restoring budget cuts, funding new initiatives, or enacting major tax cuts. While this "growth gap" will sharply limit the state's budgetary flexibility in 2006, the larger story and more difficult lesson in fiscal reality is that the Commonwealth faces similarly tight budgets for years to come. Michael Widmer's lucid op-ed "State budget squeeze play" (April 24) explained how difficult it will be to reverse the $3 billion in painful budget cuts. What caused this crisis? During the 1990s Massachusetts became one of the most aggressive tax-cutting states in America, cutting taxes by more than $3 billion. For the third consecutive year, Governor Romney has proposed significant changes in the tax laws affecting corporations doing business in Massachusetts. Although some of the 168 sections of the Governor’s bill simplify and modernize the Commonwealth’s tax laws, the proposed changes in tax policy and administrative discretion are actually more sweeping than the administration’s previous two "loophole closing” packages combined and continue a major reversal of the progress that Massachusetts made during the 1990s in improving its tax climate. You might believe we were right about the so-called Massachusetts Taxpayers Foundation when its president, Michael Widmer, has a column published in the Boston Globe just days before the House debate over whether to keep the 16-year broken promise broken or finally roll back the "temporary" income tax hike. His op-ed provided MTF's usual cover for tax-and-spend legislators. They in turn gave the middle-finger Beacon Hill salute to taxpayers and 59 percent of the voters and could justify it by quoting the alleged "nonpartisan MTF." But you know we are right when today his column is praised as "lucid" by Noah Berger, executive director of the Massachusetts Budget and Policy Center -- formerly known as TEAM ("Tax Everything And More") -- and provided Berger with an excuse to call for higher taxes. "Citizens for Limited Taxation executive director Barbara Anderson, who says the TEAM acronym should have stood for "tax everything and more," sees the name change as an effort to camouflage the group's left-wing image. "I think they're trying to get away from TEAM because people aren't into liberals anymore," says Anderson." Can this be the same Michael Widmer and MTF whose February "bulletin" complained about proposed state tax policy and suggested that the Bay State is headed for the "Taxachusetts" mantle again? You'll notice MTF's concern in its bulletin is raised over proposals to eliminate "loop holes" on Widmer's fat-cat patrons. It must be embarrassing to be such a transparent hypocrite and shameless corporate shill. I was just thinking. 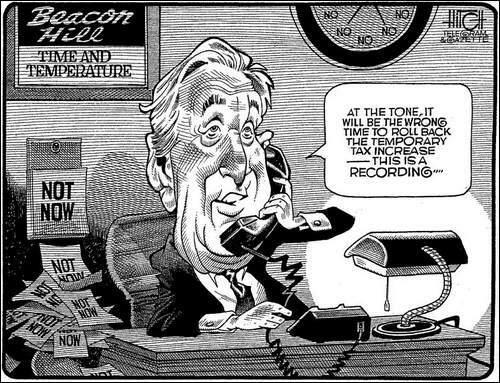 Back in 1989 when the Legislature debated and passed the income tax hike, we know it was promised to be only "temporary." We have the quotes to prove it (see "Was it a Promise or wasn't it? You decide." -- a PDF file; requires Acrobat Reader). But I recently recalled, besides "temporary" it was also sold as being for "only 18 months" on a number of occasions. On July 9, 1989, for instance, the Middlesex News (now the MetroWest Daily News) reported: "In defending his vote, Rep. David P. Magnani yesterday emphasized that the hikes would only be in place for 18 months and that revenue generated would only go towards past bills." "Only in place for 18 months"? "Revenue generated would only go towards past bills"? In but another two years, those "18 months" will become -- 18 YEARS! And they wonder how we ever got this cynical, why legislators can't be believed, trusted or respected? They range from $25,000 for the Plymouth Boys and Girls Club to $12 million to purchase land for open space in Braintree. In between, there is $50,000 for a boat ramp in North Quincy, $500,000 for crime lab equipment for the Plymouth County sheriff and $2.5 million for sea wall repairs in Hull. The original $23.6 billion House spending plan for the fiscal year starting July 1 was unveiled two weeks ago. It sought to drop so-called "earmarks," or money for local projects added to the budget. But many of the earmarks have since been revived as proposed budget amendments. The overwhelming majority of the 1,309 budget riders filed this year will be dropped by the time representatives finish debating the budget this week. But others will make their way into law, meaning more money for the districts of successful lawmakers. Gov. Mitt Romney has been critical of the time-honored practice of legislators using the budget to tell state agencies how and where to spend their money. Romney has the ability to veto specific line items from the budget once it reaches his desk. But lawmakers defend the practice, saying they have a responsibility to fight for spending items and programs important to their constituents. "Our job is to advocate for our district," said Rep. Thomas O'Brien, a Kingston Democrat who along with Rep. Vinny deMacedo, R-Plymouth, wants $70,000 for new lights and to resurface Elmer Raymond Field in Plymouth. "We certainly don't want to have other communities receive earmarked funds and find out we missed an opportunity to secure funds for projects that are important for our communities." Rep. Walter Timilty, a Milton Democrat, proposes spending $100,000 to bring the mounted ranger unit back to the Blue Hills Reservation. The amendment would reverse a decision by the state Department of Conservation and Recreation to disband the unit. While many proposed amendments concern specific projects in cities or towns, others target specific constituencies. Rep. Louis Kafka, a Stoughton Democrat, wants to restore a $5 per day, per resident subsidy to nursing homes that serve kosher foods. Because serving kosher foods involves a cost, the state Division of Medical Assistance has traditionally paid a subsidy to nursing homes with kosher kitchens. Kafka said the subsidy - which adds up to just under $1 million a year - was mistakenly dropped from the House budget proposal and needs to be restored. The South Shore's most frequent filer of budget amendments is Rep. Garrett Bradley, D-Hingham, with 29. Rep. Frank Hynes, D-Marshfield, has none because he missed a filing deadline, an aide said. Kim Haberlein, spokeswoman for House Speaker Salvatore DiMasi, said that while the amendments will be considered on their merit, many will be set aside. "We have finite resources, there's not a lot of room for growth in this budget," she said. The funding maneuver, known as an “earmark” in Beacon Hill lingo, sets aside a certain amount of a budget line item for a specific local program — typically at the request of the lawmaker who represents the city or town where the program is located. Each earmark doesn’t necessarily add to the bottom line of the budget. In the first two days of debate, House lawmakers added about $13 million to the budget. Some of the earmarks approved yesterday included $104,123 for a teen parenting program in Framingham, $50,000 for a transitional housing program in Lynn, $30,000 for a Big Brothers and Big Sisters program on Cape Cod, and $50,000 for an Alzheimer’s program in Springfield. Other earmarks include $12 million for school nurses and school-based health centers; $150,000 for a children’s anti-obesity school nutrition pilot program; $81,000 for a statewide Lupus database; and $120,000 to combat domestic violence among gay men. When House Democratic leaders initially unveiled the stripped-down budget, they urged fellow lawmakers to resist the urge to add earmarks to the spending plan. Critics say the practice undermines the integrity of the budget by siphoning money away from state agencies and departments. They say department heads should have a freer hand to decide how to spend the money allotted to their agencies. But lawmakers say earmarks are often the one sure way to bring home money for important local projects. They say they know what’s best for their communities, and point out the earmarks are often relatively small amounts of money compared to the entire budget. The earmarks were approved as the House entered the second day of budget debate, with much of the action taking place off-stage. During the course of the day, lawmakers met in closed-door sessions to hash out differences and consolidate dozens of amendments into a single document. They then emerged to approve the mega-amendment, often with little debate, before returning to the private sessions. • $250,000 for a safe neighborhoods program in the Dorchester neighborhood of Boston. The House is expected to continue debating the budget for several days. By a 135-21 vote Monday, the hacks in the House decided to keep the money ... for the children. Their children, not yours, unless your name is Donovan. If you'd like to get some idea of the kind of "children" who are cashing in on a budget awash with billions of dollars, consider the case of Matt Donovan. You may not know the name, but you've seen him on TV, over and over and over again. He's the idiot in the stands at Fenway last week who threw the beer on Yankees outfielder Gary Sheffield. He's going to have a hearing soon in the BMC, and remember, everyone is considered innocent until proven guilty, especially a hack with beer on his breath. And be assured, Matt is a hack's hack, a second-generation payroll patriot. He is a $68,280.90-a-year "assistant clerk magistrate" in the juvenile court in Cambridge, picked after a nationwide search that had absolutely nothing to do with the fact that his father, Michael Donovan, is the $88,675.50-a-year clerk of the Superior Court, civil, across the river in Boston. This is how it works in the hackerama. Your rotten kid doesn't work directly for you. You get somebody else to hire the young nitwit, and then, when your son's benefactor has some churlish youth of his own in need of gainful unemployment ... well, one hand washes the other, shall we say. But the two Donovans, father and son, are merely the beginning of the Donovans slurping at the public trough. And there are scores - make that hundreds - of layabout clans just like them, larded, in more ways than one, across every state payroll. Think Matt Donovan and multiply him by 10,000, and remember that after 20 or 30 Bunker Hill Days, his pension will be five or six times larger than yours. Matt did not return a call yesterday; neither did his father; and neither did a woman reliably reported to be Matt's wife, who is also employed in the court system of Suffolk County, for $36,341.32 a year. More of the Donovan family tree: Mike has a $68,280.90-a-year assistant clerk on his payroll named Steve Donovan. That would be his brother. Clerk Donovan also has a $30,412.71-a-year assistant named Kathy Noone; that would be Mike's wife, cleverly using her maiden name so no one will ever figure out who she's married to. She is Matt's stepmother. Kathy Noone has a sister named Peggy. Peggy is married to John Nucci, who is the $97,544-a-year clerk of the Suffolk Superior Court, criminal division. Nucci used to be on the City Council, where he served with Richie Iannella, who has also moved to the courthouse, where he is the register of probate. His father, Chris, was on the City Council, and his brother, Chris Jr., is on the Governor's Council, where he serves with Kelly Timilty, whose brother is a state senator (as was her father, before he went to prison). Kelly also has a cousin who is a state rep, and whose uncle is a ... court clerk, in Norfolk County. I mention this only so that you can understand why you can't get the tax cut you were promised and voted for. Your money is going to the children - the children named Donovan and Timilty and Iannella. One final question: do you think Matt Donovan will be able to get a fair shake in the halls of justice? Howie Carr's radio show can be heard weekday afternoons on WRKO AM 680, WHYN AM 560, WGAN AM 560, WEIM AM 1280 and WXTK 95.1 FM. As a sizeable number of Beacon Hill leaders working to craft the 2006 state budget already know and others are quickly discovering, the reality of the state's finances is far different from the expectations that accompany an economic recovery. This austere outlook is counterintuitive. The state has painfully worked itself out of the severe fiscal crisis triggered by the 15 percent plunge in tax revenues in fiscal 2002, generating a small operating surplus at the end of fiscal 2004. While job growth remains anemic, personal income in the state is increasing at a healthy pace, and tax revenues are on the rise. Largely unavoidable increases in some of the biggest areas of state spending Medicaid and other health care, capital investments, school building, and other education aid, among others are now requiring almost a billion dollars of additional spending each year, compared with likely revenue growth of about $700 million in both fiscal 2005 and 2006. For much of the 1990s, the state had to deal with only one major financial commitment: to increase dramatically its contributions to local schools as part of education reform. At the same time, Medicaid spending was close to flat. While annual revenue growth is likely to be healthy over the next several years, the expected performance is a far cry from the double-digit increases of the late 1990s. Based on history, the state can expect economic and revenue growth of about 5.5 percent, or $850 million, a year on average. At this level, the budget squeeze will continue beyond 2006 $850 million is only slightly more than the revenue growth assumed for the 2006 budget and is still not enough to pay for all of the mostly non-controllable growth in spending. Contrary to popular impressions, the Commonwealth is not awash in huge budgetary surpluses. After accounting for one-time funds and deferred costs, fiscal 2004 revenues exceeded expenditures by only $200 million, a minuscule 0.9 percent. While fiscal 2005 revenues are on track to exceed the forecast by as much as $500 million, the budget relies on almost a billion dollars of nonrecurring revenues and savings to pay for ongoing program costs, leaving a roughly $500 million structural gap going into fiscal 2006. What emerges is a picture of extremely tight finances in the coming year, confirmed by the "bare bones" budgets proposed by the governor and the House Ways and Means Committee, and, more important, a set of longer-term forces that allow almost no relief from the fiscal squeeze for the foreseeable future. With largely nondiscretionary growth in annual spending consuming most, if not all, revenue growth, the state will have little capacity to restore any significant portion of the roughly $3 billion of spending cuts imposed during the fiscal crisis or to finance expensive new initiatives, such as the $1 billion commitment to early child education and the unknown, but surely large, costs of expanded healthcare coverage. This spells big trouble for higher education, public health, and other important programs that have been decimated by the recent spending reductions, for municipalities who have had to lay off teachers, reduce services, and raise taxes and fees to offset cuts in state aid, and for those who want an increased state commitment to help fulfill the promise of education reform. Any hope of addressing these concerns will depend on reining in the growth in healthcare costs, which now account for one-third of state spending, and restoring the more than 200,000 jobs lost during the recession. When the recession came, Massachusetts paid for these tax cuts by cutting higher education funding by 24 percent in real terms and by leading the nation from 2002 to 2004 in state cuts to K-12 education. The state also ended healthcare benefits for thousands of low-income people and underpays the providers that care for them. 1. We must insure that our people are the best educated and trained in America. 2. We must invest in healthcare to protect all and strengthen the healthcare and life sciences sectors that could power our economy. As Massachusetts led the nation in job losses during the recession, it appears that cutting taxes was not an effective job policy. Perhaps it is time to repeal some of those tax cuts so we can afford to build a strong economic future. The most far-reaching provisions would give the Commissioner of Revenue unprecedented authority—broader than that available to the IRS or any other state revenue commissioner—to increase the tax liability of many of the state’s largest employers, undercutting the predictability that is central to a fair and equitable tax system. Under the banner of "loophole closing,” other provisions expand existing taxes or impose new ones, including extending the sales tax to prewritten or "canned” software that is delivered electronically to the purchaser, applying the deeds excise tax to the transfer of ownership of a business that owns real property in the state, and imposing the corporate income tax on some income of non-profit organizations, and establish several new penalties which would be imposed largely at the discretion of the Commissioner.